Our toddler class is from 15-24 months. 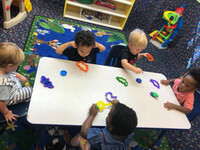 At Love and Learn Academy we pride ourselves in being more than just a daycare. We keep our student to staff ratio low, so that all the children in our program can have access to the attentive care they deserve. Lot of fun arts and crafts!